I saw my first surgical reconstruction of a ruptured ACL in 1981. I began studying ACL's in 1991. I performed my first ACL reconstruction in 1992. Since starting my practice in Austin in 1996 I have performed over 400 primary recontructions. The essential techniques remain basically unchanged. A graft of some sort is strung through the knee to "reconstruct" the anterior cruciate ligament. This process takes roughly six months to form a "new" ligament. Wouldn't it be easier to just not have an ACL tear? YES! Prevention is worth a pound of cure. Until recently no one really considered that prevention was possible. It may not be. This point is argued in multiple disciplines: orthopedic surgery, physical therapy, sports medicine. No one knows. What is state of the art in 2010 is core training, jump training, hamstring fitness, proprioception improvement and flexibility. Every orthopedic surgeon knows that anterior cruciate ligaments fail more frequently in female competitors. Why remains a mystery that is discussed wherever knees are contemplated. Do women jump differently? Do they land funny or have too straight a knee at contact? Do hormones play a role? All valid questions without certain answers. There are many theories and lots of reseach being done. No conclusive findings regarding the difference between men and women have been found yet. There are many prevention strategies also with unproven results. I feel that there probably is some protection provided by these programs. I am also sure that athletic performance is enhanced by improved muscle strength and flexibility. I have been using these techniques with the teams that I coach for the last six years. I can't say that I've prevented any tears but we haven't had any. I continue to look for more effective proven regimens and solutions. 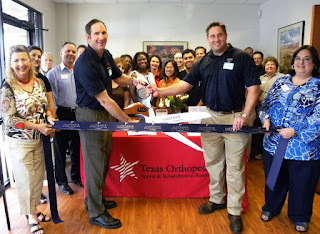 Thank you to all those who joined us at our Round Rock Open House and Ribbon Cutting. The Round Rock office is located at 2120 North Mays Street, on the IH 35 access road just north of Highway 79. Doctors Scott Smith, Marc DeHart, and Christopher Danney will be seeing patients at this location.